Chris Jackson started Terrafilum with one idea in mind – provide 3D printer users with the highest quality, eco-friendly filament solutions on the market. They offer several types of recycled and recyclable filaments for any large-scale industrial project with the ability to meet any engineering requirements. Their products have been tested to ensure the appropriate amounts of recycled content are used while remaining stable throughout the 3D printing process. 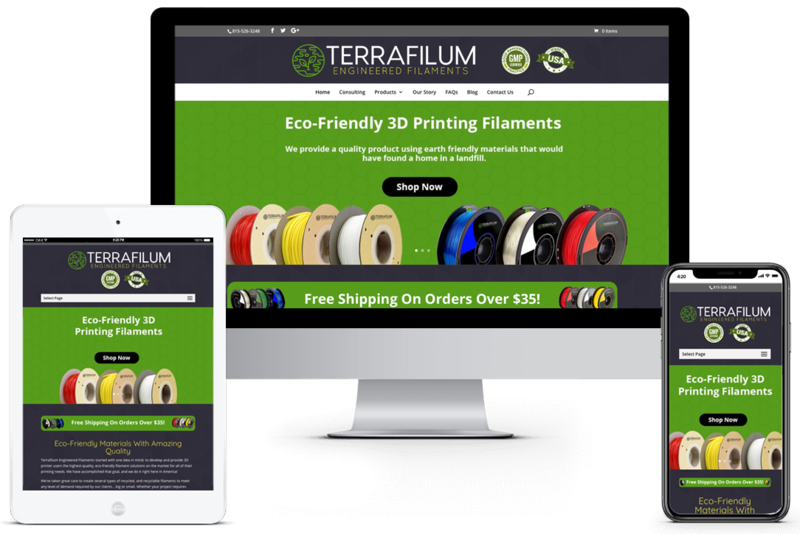 We created a WooCommerce website for Terrafilum that not only addresses their need to sell products but does so clearly and efficiently. Their site allows users to drill down quickly to the products they are interested in. Additionally, Clicks Web Design provides all the photography and video work for their products and brand to ensure their site looks professional and consistent.